This journal offers a vehicle for discussion of the rapidly-expanding practice of place branding. Spanning disciplines from public relations through destination marketing, to brand strategy, export branding, economics and cultural policy, the journal presents coverage that is deep and detailed. 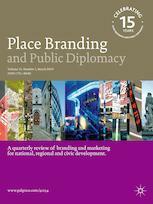 The journal Place Branding and Public Diplomacy explores and explains the two related but distinct practices named in its title. 'Place branding' applies brand strategy and related techniques to advance the economic, social, political and cultural development of cities, regions and countries. 'Public diplomacy' describes the processes by which a nation, a region or a city conducts foreign policy by directly engaging with a foreign public. The journal examines the two concepts in their own right, and also at their many areas of convergence. Up to now, the successes - and failures - of nations, regions and cities in pursuit of reputation management and influence of external audiences have been documented and analyzed in a fragmented fashion across many disciplines. Place Branding and Public Diplomacy draws together the relevant discussions to provide a single comprehensive, coherent platform for considering all the facets of the topic. This authoritative journal presents peer-reviewed articles, along with news, debates, interviews, literature reviews, case studies and special features. Place Branding and Public Diplomacy is a comprehensive, international forum that invites practitioners, researchers, students, consultants, government specialists and the general public to debate current issues and share best practices. Which city theme has the strongest local brand equity for Hong Kong: green, creative or smart city?